The two women stood in the best parlor, a long room, furnished with aggressive plush and mahogany, and onyx tables, and a marble Clytie drooping her head impudently in her out-of-place state in a New England parlor. The room was chilly in spite of the radiators, glaring with gilt in the most conspicuous wall spaces. Every piece of furniture — old-fashioned square tables, chairs, and piano — was covered with dainty things, large and small, of all colors and fabrics. “To think you made everything here with your own hands!” commented Miss Lottie Dodd. She was a distant relative of Mrs. Bannister's, who lived with her a month at a time. “You do that so beautifully,” said Lottie. She was a tiny woman snugged in a lavender wool shawl. The tip of her sharp nose was red. Her blue eyes were tearful, from cold and enthusiasm. Lottie was prey to enthusiasms, even petty ones. “You don't mean it.” Lottie's voice was as blatantly innocent as a lamb's. Again the look of suspicion was in Sarah's eyes, to disappear before the other woman's innocent expression. Then the doorbell rang with a loud clang. “Sakes alive! Whoever can that be, such a cold afternoon?” said Mrs. Bannister. “Well, if it is, he vamooses. I never will allow a peddler in my house.” Sarah Bannister sneezed three times. Sarah recognized that inflection. “I rather guess I'm as able to go to the door as you,” she retorted. She thrust her face almost into the other's in a way she had when irritated. “It was only on account of your cold, dear,” protested Lottie, shrinking back. Sarah stepped majestically doorward as the bell rang again. She walked on her heels as she had a trick of doing when feeling unusually self-sufficient. Lottie peeked around the curtain over the pots of geraniums, but she could see nothing. She could hear voices, and the wind came in the cracks of the sitting-room door. The front door closed with a bang, and Lottie darted back to her chair. She expected to see Mrs. Bannister enter irate after turning away a peddler, but after Sarah entered a young girl, hardly more than a child. “Go right to that hearth fire and sit down and get warm through,” ordered Mrs. Bannister. She spoke in a stern voice, but her speech ended in a beautiful cadence. When the child was seated before the fire, which Sarah stirred to a higher blaze and piled with more wood, she gazed at the young face reflecting the red glow, and smiled in a way that made Lottie gaze wonderingly at her, and suddenly remember that years ago, so many years that she had forgotten, Sarah Bannister had lost a daughter about the age of this girl. Meantime Sarah Bannister was removing the girl's extraordinarily shabby hat, and pulling off gently her shabbier coat. The girl resisted the last a little, and her small timid voice murmured something about her dress. “How old are you?” demanded Sarah Bannister, suddenly. “Thirteen last May,” replied the girl. Her voice was charming, with a curious appeal in it. She seemed to be begging pardon for the fact that she was thirteen last May. Sarah Bannister, her face working as if she were about to weep, went to a little china closet, and presently came back with a glass of homemade wine, and a square of sponge cake on a pink plate. She set a small table beside the girl and placed the wine glass and the cake on it. “Thank you, ma'am,” said the girl. She began to eat and drink rather eagerly. She was evidently famished, but very gentle about it. She still retained her hold of the bag. Lottie spoke for the first time. “What have you got in that bag?” said she, rather sharply. The girl flashed her blue eyes at her in a frightened but defiant way. “Things to sell,” she whispered. “When you have finished your cake and wine, and get real warm, I will look at the things you have to sell,” said she, softly. Lottie began to be aggressive. “What is your name?” she asked, peremptorily. “Don't speak so sharp, Lottie,” said Sarah. “You will scare her half to death. She's nothing but a child. She was half frozen. She was standing there on the doorstep, shaking from head to foot, poor little thing, half dressed, too, on such a day as this.” Sarah glanced at the heap of wool and red silk rags on the chair, and remembered a nice thick wool coat in the closet of a certain chamber. “He preaches very well, too,” said Sarah, kindly. “Father is not broken-down. He stands up as well as you do,” said Joan, unexpectedly. Then she began to rise. “Where is my coat?” said she. “That was the little Hyde's Corner church,” interpolated Lottie. Sarah nodded. “What does your father do now?” asked Lottie. “We don't have as much money as we did before the fire,” stated the little girl, “and we don't have much of anything to give away. That is why —” She stopped. “Well, let us see what you have to sell,” said she. Joan mentioned a price. Lottie paled, and her mouth dropped when Sarah Bannister, so careful of money, said she would take it. 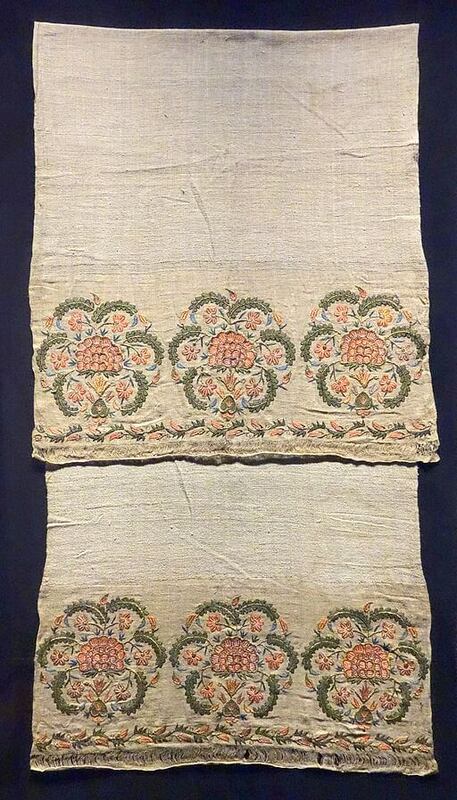 She also bought for a large sum a beautiful tablecloth with embroidered corners for the minister's wife. “That's just like the one you made yourself for Mrs. Lester Sears,” said Lottie. She thought Sarah Bannister must be losing her wits. “There's that same cornucopia in one corner, and cluster of daisies in another,” she mentioned, feebly. “You'll have to tell her you didn't make it,” remarked Lottie, maliciously. The more Sarah Bannister bought, the more the little girl's face beamed. Her cheeks flushed; her blue eyes gleamed. Sarah kept gazing at her with loving admiration. As she bought everything in the bag, Joan seemed fairly quivering with delight. She held her pretty upper lip caught between her teeth, lest she break into sheer laughter. “I thought I saw one in the parlor just like that,” said Lottie. “So you did, similar. Mine has a queer little quirk at the top of the G, and that is for Emma Gleason. I wanted to make another for Ella. Lottie, do you mind going upstairs and bringing down my little black silk shopping bag? My purse is in it. I don't want to go through that cold hall. I have got the grippe; I almost know it,” said Sarah, when the bag was empty. “I remember hanging it there when I hung up my coat when I came home yesterday,” replied Sarah, calmly. Sarah loosened the strings of the bag. Lottie watched like a cat. Sarah took out her nice black leather pocketbook. Lottie craned her neck. Sarah bent over the pocketbook, hiding her proceedings, counted out money, folded it in a nice little roll, and gave it to Joan. Joan rapidly slipped into her ragged coat. Sarah thought of the warm one upstairs, but did not somehow feel like mentioning it. “You mean to say you don't tell your mother about this?” said Lottie. “No danger, seems to me,” said Lottie. When the girl had gone and was disappearing down the road, a red rag from the silken lining of her coat blowing back stiffly in the icy wind like an anarchist flag, the women stood at the window, watching her. “She is a darling little girl,” remarked Sarah, with an absent air. “She thinks this beautiful girl looks like her,” Lottie reflected. Lottie lied for the sake of her own heart. “Yes, so she is,” said she. Sarah paid no attention. “The things cost just twenty-three dollars and seventy-nine cents,” said she, coolly. Sarah began to speak, but the door bell cut her short. “Who in the world is coming now?” she murmured, and smoothed her hair and straightened her apron strings. Lottie went, her head erect. Directly the door was opened Sarah heard a loud, very sweet, very rapid voice, and knew the caller was Mrs. Lee Wilson. Mrs. Wilson danced in ahead of Lottie, who followed her sulkily. She did not like Mrs. Wilson, who was so much prettier than she ought to have been, considering her years, and so much gayer and livelier, that it seemed to give grounds for distrust. Mrs. Wilson slipped back her handsome fur neck piece, disclosing a deep V of handsome white neck, which Lottie glanced at, then openly sniffed. Then she spoke in a voice which seemed drawn out like thin wire. The voice had hissing sibilations. “Don't you feel cold, Mrs. Wilson?” said Lottie. Lottie flushed. “I care more about decency than I do about style,” she snapped. Her animosity was no longer disguised. “I thought an aunt came, or something,” said Sarah. “Didn't the aunt take them away?” asked Lottie. “Guess the aunt came back,” said Lottie, rather indifferently. Lottie was always indifferent when it came to large families of the poor. It had always vaguely seemed to her like something immoral. “Christmas is right here, next week Thursday,” remarked Mrs. Wilson, helplessly. “If my cold is better I will go and see these children tomorrow, presents or no presents,” said Sarah firmly. She nodded. “Your cheeks do look pretty red,” said she. “I'll wait and see how I feel in the morning,” she said as Mrs. Wilson rose to go. “Well, this is all,” she said, finally. Lottie examined everything. Sarah watched. She was rather pale. Finally Lottie came forward and stood before Sarah with a determined air. “That tablecloth ain't here,” said she. “Some other things ain't here, too,” said Lottie. “Next to the top one,” Sarah whispered, feebly. Sarah took the square of glistening linen, with its graceful embroidery, and examined it. She lingered long over one corner. Her lips tightened. She folded it carefully. “Lay it over on that other chair,” said she. “There are still four more things missing,” said Sarah. “I haven't told you,” moaned Sarah, weakly. “She had ought to be took up!” she said, with decision. “Why, Lottie, how you do talk! What has got into you?” Sarah said, weakly. Then she began to weep again. The doorbell clanged. Lottie ran to the window and peeked. “If he don't offer it up to his wife, it's all right,” Lottie said in a loud whisper, on her way to the door. When she returned, the minister, Silas Whitman, followed her. He had removed his topcoat and appeared clad in clerical black, shabby, but tidy and beautifully kept. Silas Whitman's salary forced careful keeping and nearly prohibited expenditure. He was a very small man, fair, with high, light eye-brows, and light hair growing stiffly from his forehead. As a result, he had a gentle, surprised expression. He took a chair near Sarah Bannister, and she went on at once with her story. Silas listened, and his expression of surprise deepened to one of positive pain. The minister was not exactly a success in this particular parish. He realized it forlornly, but saw no way out. He was a man whose genuine worth and attainments were dimmed by his personality. He was like a rather splendid piece of trained mechanism doomed to one track, which did not allow him to even use many of his abilities. He was overeducated for the little New England village; he was overinformed; mentally he towered among them like a giant among Lilliputians. There was not among them a man or a woman to whom he could betray his everyday thoughts of the great present of the world. Not one could have understood. During the war he had done his best to discharge his duty to his God and his country among a people whom the war, in spite of their Red Cross work and their contributions to the Expeditionary Forces, never reached. It came the nearest to reaching them when the profiteers hid the sugar and the scarcity began in the stores, when Mrs. A couldn't make currant “jell” and Mrs. B couldn't make peach preserve, and Mrs. C and all the rest of the alphabet could not bring sweet cake to the Ladies' Aid parties, when the men missed the sugar from their coffee; then it seemed to the minister as if through the fruit and pickle season his good New England people peered out and up, almost enough to smell powder and hear the roar of the cannon. At that time the minister preached two war sermons to full congregations, and had hopes. However, after the fruit season, the people settled back in their ruts of the centuries. The minister nodded, and Lottie re-entered, leading Joan, or, rather, pulling her, for the little girl seemed to resist. The child interrupted. “What is the matter?” she inquired, with the sweetest air of pity. “What have you got in your bag today?” Sarah inquired, rather hopelessly. The girl obeyed at once. She drew forth, one by one, the missing articles of Sarah's collection. She eyed them admiringly. “Pretty,” she commented. “Why don't you speak right up to her?” said Lottie. “Yes, ma'am,” said the child, looking up brightly. The little girl gazed. “I am real glad you found out so soon,” said she. “You aren't going right on selling me my own things?” gasped Sarah. The minister spoke for the first time. “Why not?” he asked. “Then I am surprised you didn't know it wouldn't be right, and had to ask me,” remarked Joan. “Why wouldn't it be just as right to sell to anybody else?” asked Sarah. “Why, they are your own things,” she said simply. “It is hers,” said Joan. She looked puzzled. “Come here, little girl,” he said, pleasantly. “Do you think she is going to pay you any more, you little —” began Lottie, but Sarah hushed her. “I am not going to pay her, but I am going to give her some more money to buy things for the Brett children,” said she. “And you don't think you have done wrong?” persisted the minister. Sarah opened her black silk bag and handed a bill to the little girl. “Kiss me, dear,” she whispered. “Will you come and see me?” whispered Sarah, fondly. They all stood at a window watching the child go down the path. Suddenly Silas Whitman began to speak. He seemed unconscious of the two women. He watched the little girl, the red silk rag from her coat lining streaming, march proudly away with a curious air, as if she led a platoon, not as if she marched alone. Add The Gospel According To Joan to your own personal library.